I refer to a former post (click here) in which I provided commentary about trees in several local location. 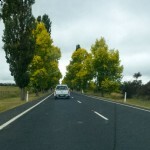 One key story was, and remains, the special lines of trees on the eastern and western entrances to Braidwood, in southern New South Wales. At the time this story was controversial given that locals were very vocal about opposing the removal or the moving of these trees. The problem being address by the roads authority was that many motorist were traveling too fast and there had been a series of unfortunate accidents, as well as some deaths. The trees were seen as part of the problem by the authority. Now comes the mysterious news. Just recently some bureaucrat down the coast has put together an argument that by slowing down the traffic for this couple of kilometres each side of Braidwood, that it is costing the South Coast businesses the amount of $400,000. When you read the local article, it seems to be just as much about a complaint about current road works. When you read the Canberra Times article there is a hint at the end of maybe there should be a fast by-pass around Braidwood. Click here for the local article – and click here for the Canberra times piece. There seems to be several things at play here. One wonders whether someone in or connected to the roads authority does not enjoy the fact that their proposal was rejected by the locals in Braidwood. Particularly after the authority had spent all that money on special ‘consultations’ and had managed to spin the line that the locals were on side with moving the trees. Or is this simply about the south coast business lobby trying to get a by-pass that gets people down the coast just that little quicker and cuts out the stops being made in Braidwood. A little rivalry between Braidwood and Batemans Bay maybe? Or something that is totally stupid. I think given how stupid this whole exercise has been, I will go for all of the above. My recommendation. 80 Kph is fast enough as vehicles approach this lovely regional city. Anyone who is urging the 100 kph per hour should not be taken seriously. Such business people should not be even listened to when they start to manufacture such ridiculous arguments. It remains the most logical and sensible to leave the trees where they are. Anyone who travels around the state will know, that the distance these trees are from the road is not unusual. It is a matter of driver behaviour that is the problem. Driving to and from the south coast does not have to be all at the maximum speed. The 80 kph needs to be permanent and maybe the slower town limit moved out just a little more to slow the cars sooner.